Hey Nathan, Eddie and Aino here. Send us an email to eddiewyw(at)yahoo.com so we have your email address to keep in touch. Hope all is good in Phuket if you are already there! great blog. just one question: I read somewhere that muay chaiya has throws and groundfighting - is this correct, especially regarding the throws? Muay Chaiya has some throws which are primarily counters, working from the basic blocks etc. When I get a little more time, I will start documenting some of the basic and advanced moves. There is no real ground fighting in Chaiya (on conclusion of some throws, there are elbows/knees on completion of the throw). I am aware that Kru Praeng has added some ground fighting techniques to his form of Chaiya. My understanding is that the ground work is a new development, as Chaiya was developed from warfare and ground techniques leave you vulnerable to multiple attackers. If you want to do groundwork, learn a real grappling style like Ju-Jitsu to compliment a striking style. 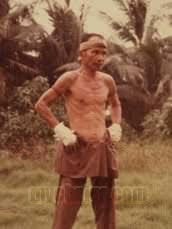 I want to expain about ground technic of Muay Chaiya in Kru Preang Style. I don't Know you can read thai ? becuase i not stong in english *-* sorry for incorrect grammar. 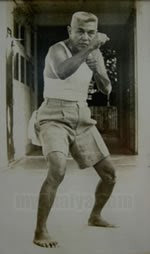 He has tech about how can fight and safe when enemy throw you down to the ground and i think you know about rule of muay thai in 1925 can continue attack when opponent down to the ground. "as Chaiya was developed from warfare and ground techniques leave you vulnerable to multiple attackers." This ture but in Duel Match not battle flied it will mean 1 on 1 fight it mean you have chance to throw the opponent and he can defend and take you to the ground with him too this time you will see ground fight will begin. Kru tong have tech Kru preang about how to safe when fall down and how can defend when opponent throw you with chaiya technic too. But you say ture about "I am aware that Kru Praeng has added some ground fighting techniques to his form of Chaiya." Becuase Kru Preang know this day the world have change many martial art can come to fight now. in some rule you will can't attack with strike. Yes, obviously ground fighting is an issue that should be addressed by any fighter, as I mentioned to Richard this should be trained in completion for example learning a full grappling system such as Ju-Jitsu. One of the things that I have come to realize in my many years of training (many styles including grappling), is that striking and grappling styles are very different sciences. In my humble opinion, each should be taught separately (obviously they can be trained together) so that all of the nuances can be taught in completion. A symptom of all martial artists is that we tend to specialise in things that work for us, or we find attractive, leaving us with our 'own' styles. This is not always a bad thing (read up on JKD) but the problem comes when people try to teach this mixture of styles. Quite often they miss the depth and detail that have been acquired by the parent arts through hundreds of years of analysis and evolution, and are not taught in the entirety because aspects of other styles are taught at the same time. There is a reason why Muay Chaiya (and other systems) needs dedication to learn, the details and subtleties of the system takes years to learn and to teach. If we add something to the system, what gets sacrificed? "But at all of development is use only Muay Chaiya.Don't have use other Martial Art for mix becuase our know Original Muay Thai is Unlimited learning"
So what you're saying is that you're figuring out the grappling as you go along? That sounds very dangerous to me. Especially if you find yourself grappling against people who have trained in proven systems, you will find yourself in a lot of trouble. Even worse if you teach this to people. On a final note, I'm still waiting for you to link to my blog from your websites. I don't like freeloader linking, so I will be deleting these comments at the end of this month (Oct 08) if I don't see you linking back.